I am going to come clean and confess something here. I have a weakness for chicks in yoga pants. YES! I do! I think it’s the greatest invention for women, ever! I have a preference for the black ones but any color would do. If you have an average booty or think you are a couple of pounds on the heavy side, do not despair, get yourself a pair of yoga pants and voila! You are transformed into a tight-assed, sleek-looking babe! Walk past a group of men and look at them check out the new you. In case you are thinking ‘Dirty man!’, it is not a sexual thing. It’s just like looking at a piece of art, you really can’t see yourself with it and really have no room for it but it’s worth admiring. You feel me? 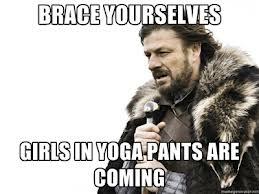 I’ll even look at a mannequin in yoga pants. Even Queen Elizabeth.